On our way through the Chicago area, we were able to stop at a wonderful community called Prairie Crossing. Prairie Crossing is the “critically-acclaimed ‘Conservation Community’ that was designed to combine responsible development, the preservation of open land and easy commuting by rail. It is now considered a national example of how to design our communities to support a better way of life. The land that is Prairie Crossing was purchased in 1987 by a group of neighbors who wanted to preserve open space and agricultural land. They formed a company with the goal of developing this beautiful 677 acres responsibly, with a total of only 359 single-family homes and 36 condominiums as opposed to 2,400 homes that were planned by another developer. George and Victoria Ranney, a husband and wife team, have guided the development of Prairie Crossing since its inception.” All of the residences are very green…take a look around their site and you’ll see all of the cool stuff they implements. I especially like the trash chutes that switch to recycling chutes at the touch of a button! Weeeee! We pulled in late and parked in the parking lot so we could catch some sleep. Little did we know that the Metra train line that goes to downtown Chicago would blaze through there every hour until morning! Once we were asleep, it was fine…but the first one that went through blaring it’s horn was quite a surprise! Despite the horn…I loved seeing an alternative to car commuting. What a great way to avoid traffic jams and be car free! After we woke up, we walked over to Prairie Croissant Cafe and had a cup of fair-trade, shade grown coffee. Scott, one of the owners, showed us many of the ways that they, as a business, are living lighter on the earth. All of their cups are made from corn and are compostable. The cork sleeves for the to-go cups (as well as the cups themselves) are compostable. 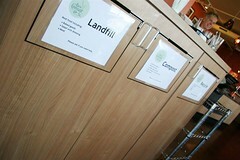 One of my favorite parts of the cafe was the “garbage” area. They have 3 compartments…one to recycle, one to compost, and one for the LANDFILL. They’re tellin’ it like it is! If we all started calling our garbage pails, “landfill boxes”…we would all probably be a bit more mindful! While we were having our coffee, Ben Ranney (the son of the original developers) came in an we had great chat about the community and all of the great things they have planned. Ben helped us get set up for the demo as well. Even though this stop was on very short notice, we had a terrific response from the community and from surrounding areas. There was a lot of interest in veggie oil conversion…and also going on the road in general. We had an especially fun visit from an online friend, Carrie Moon, and her kids. We also found out that her husband, Kevin, works at Trinity International University in the security division…which is where we were meeting Matt’s cousin, Heather, that night! So…we had a really easy time getting a parking permit! Thanks Kevin! I love it when God takes care of all the little details. Overall, it was encouraging to see how a group of concerned citizens CAN make a huge impact. Effective, earth-friendly planning of a development can make such a difference for the environment and for the resident’s quality of life. It’s a very tight-knit community…everyone seems to know everyone else. The homes are very different than your typical suburban McMansion…they have REAL front porches and the garages are tucked behind. They have trails to walk on, an organic farm on site, an environmental charter school, and cute little shops. Currently, they have the coffee shop, a Ten Thousand Villages, a children’s bookstore, and a children’s clothing/toy boutique. There is a yoga studio coming, and other great amenities! We truly enjoyed our time at Prairie Crossing. 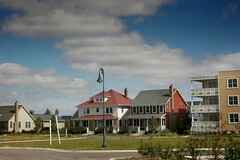 Prairie Crossing has been nationally recognized for its innovations in planning and community design. It has been featured in the New York Times, the Wall Street Journal, the Chicago Tribune, the Daily Herald, Landscape Architecture, and the National Geographic. Its houses and native landscaping have been highlighted in Country Living, Midwest Living, and Better Homes and Garden’s Perennials.